With the world population growth slowing, some countries are staring at the grim prospects of the unbalanced demographics in the workforce and the dire economic consequences this will cause. 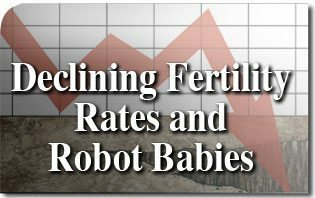 As a result, some curious efforts to bolster diminishing birth rates have surfaced, not least of which is the invention and promotion of robotic babies in Japan. Students from the University of Tsukuba believe they have answered the call to correct this problem by inventing a robotic baby called Yotaro. He does not look exactly like a human, however he cries, sneezes, giggles when tickled, and becomes calm at the sound of his rattle. Their hope: inspire parents to have children when seeing baby Yotaro. When asked why he created the robot baby, project leader Hiroki Kunimura said that Japan’s low birth rate was not the initial reason. However, later when he began to see how people reacted to Yotaro, he imagined the possibility of a robotic solution to a social crisis. While Japan is desperate to find an answer to their rapidly aging population, mechanical babies hardly seem to be the solution. Japan’s fertility rate fell below two children per woman in 1975 and is now holding steady at 1.39. The nation has one of the world’s highest life expectancies and can expect to have 40 percent of its population to be over 65 by 2050. Japan is not alone in this demographic crisis; Russia’s birth rate has been falling steadily since the 1990’s coupled with a high death rate due to alcohol abuse. That nation is now offering prizes ranging from refrigerators, money and even cars if a woman gives birth nine months after the National Day of Conception, September 12. Romania approached a zero percent population growth in the 1960’s and enforced drastic measures to reverse the decline by prohibiting the importation of birth control and posting police in hospitals to ensure that no illegal abortions were performed. This of course only lasted as long as police were in the hospitals. By the 1980s, General Secretary of the Communist Party Nicolae Ceausescu faced the same dilemma only to contrive another false solution to the problem. He instituted Demographic Command Units to ensure that pregnancies came to term, interrogated childless couples and only allowed an abortion if a woman had five or more children. Of course, his concerns were hardly moral matters, but only efforts to secure the perpetuity of the Romanian Communist regime. Superficial rewards, coercive force and emotion evoking robots will not solve a moral crisis. The answer lies in analyzing the change in a people’s values that caused the decline. For example, Catholic Spain held one of the highest birth rates in Europe in the sixties averaging four children per woman. This was during a time that they did not have divorce, contraception or abortion. By 1978, the Spanish constitution abolished the Catholic Church as the official state religion and modernized its moral values. Young men and women became fixated upon acquiring wealth, building a career, having fun or dismissing marriage altogether. Spain’s fertility rate has now plummeted to 1.47 children per woman. Society as a whole has traded the notion that man exists for the glory of God, for the notion that it exists for pleasure. This disregard for the tenets of Christianity and the laws of nature is now bearing the bitter fruits of an approaching demographic disaster. Only a return to order — not robot babies — can provide the solution. This entry was posted in News Commentary and tagged abortion, baby, Birth, Catholic, children, Christian, comment, communist, Conception, Demographic, Disaster, fertility, grow, human, moral, nation, news, population, rate, religion, robot, State, TFP, value, woman, world by Gary Isbell. Bookmark the permalink.